Issue 1: How do we show commitment to building trust between people with a disability, families, workers and organisations? People feel more trusting of an organisation where the experiences and perspectives of people with a disability and families are at the heart of how we work, and we have a real sense of obligation to uphold that trust. We are also explicit when we talk with people that we believe strongly in the NDIS principles of choice and control – that they are in charge of making decisions and choices about their supports and we are here to help make it work for them. However, we know that personal experience alone does not ensure a good service; we also have to make sure our practices meet all the statutory requirements and pass the various evaluations and audits in the four states in which we now operate. We take the time to explain to clients about how we meet these safeguarding and quality requirements, as well as discussing their support services and agreeing on how we will deliver them, and working with them to develop plans about any risks and concerns they may have. People need to feel they are being listened to and their wishes and concerns respected. They need to feel confident that the provider will live up to their commitment and will willingly address any emerging concerns. We believe that the My Supports model of carefully matched support workers who are part of a Neighbourhood Team strengthens people’s trust that they will get individualised support, backed up with close supervision and local relief staff when needed. The individual matching with clients, plus the support of a local team, creates more meaningful work and less isolation for our support workers. We also employ all staff as permanent rather than casual, showing our commitment to them and creating trust and loyalty. Issue 2: What avenues are there for disclosing issues safely and confidentially if things go wrong between individuals and their workers? We believe this starts with taking the time early on to discuss with clients our commitment to disability rights, and what these rights and the national disability standards, as well as their consumer rights mean for them regarding how we will deliver their supports. We talk through their right to complain, how to make a complaint, how we will help them if they make a complaint, and assure them that complaints and concerns are always handled sensitively and confidentially. Clients have a number of regular contact points into our organisation including the support worker, the team leader/coordinator and the team coach (who supervises the work of team leaders/coordinators), directly to head office if they wish and via satisfaction assessments. Some people may need to be supported to complain by independent (non-provider) assistance, and we welcome help from informal supports or an advocate. Where it is clear a person would benefit from skill or capacity building to increase ability to self-advocate, the NDIS should be encouraged to look at that option for the client. My Supports also collaborates with others; the NDIA planner or LAC will have direct client contact, and where decision making is being supported, or there are vulnerabilities, advocates are encouraged to be a part of the client’s ongoing network. My Supports documents all clients’ NDIS goals, related to the support we provide, in our client system. After each shift, the support worker writes online journal notes on how the goal was supported – building an ongoing evidence base for the client. These goals and the updated evidence base are reviewed regularly with the client and whoever else is important to them. Early signs that things may be “going wrong” in some way may be identified through the journal notes or regular goal reviews, and provide a chance to act to address any issues, as well as reviewing general satisfaction and progress towards plan goals. Similarly, regular discussions around risk plans may provide opportunities for people to raise concerns confidentially. Issue 3: Who is responsible for offering professional development to individuals, their families or their workers as we navigate this new NDIS world? We believe that this is the role of any good organisation – but it is a role that takes an organisation-wide commitment to our values, teamwork, many different skills, having a learning and sharing culture, and careful collaboration. It is a very exciting time in our sector – but an incredibly challenging time. The NDIS is a work in progress, as we all know. It is important that a client is supported by a provider who knows the NDIS well, is up to date with developments, and can assist a client to know what the NDIS can mean for their own goals. My Supports has regular contact with NDIS leaders and decision makers in each state, and we are sometimes invited to be a part of trials or tests. 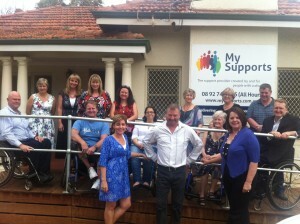 We are also part of nationwide peer networks discussing NDIS as it evolves. This helps us to be able to keep individuals, families and our staff up to date with the latest information. We regularly share information on our social media, via our client and staff database and run NDIS and Pre-planning workshops for people with disabilities and their families. Many clients found it a challenge when they received a call from the NDIS to express what “their life goals were” or “what support do I need”. So these practical sessions, where clients work on their own planning booklet in the group, means they are better prepared for their NDIS discussion. We also have Facebook groups for staff where we share information on training and development, details of policies and how we work, and any other information to support their work. The Neighbourhood Team Staff Facebook groups have a more local perspective, with staff sharing information about local services, resources, events and connections.